Two Democrats on the House Armed Services Committee have called on the Army to release its lessons learned report on the Iraq war that reportedly concludes the military was hamstrung by poor resourcing and guidance from the top. In a letter to Army Secretary Mark Esper and Army Chief of Staff Gen. Mark Milley, Reps. Jackie Speier, California, and Ruben Gallego, Arizona, who served as an enlisted Marine in Iraq in 2005, called for the quick and public release of the report, initially ordered up by then-Army Chief of Staff Gen. Ray Odierno in 2013. It had previously been reported that a draft of the report, completed in 2016, concluded that the U.S.-led coalition effort in Iraq was "largely unsuccessful" due to failures to provide enough troops to accomplish the mission and the "under-resourcing" of efforts to train and advise the Iraqi security forces. The document was ultimately held from publication. In their letter, Speier and Gallego expressed their "great concern over the prospect that the Army is withholding an unclassified history of the service's performance in the Iraq war." "We have heard conflicting information on the report's expected release date [reportedly next month] and urge publication as soon as possible," the letter said. "This is simply the Army being unwilling to publicly air its mistakes," Speier said. "It's no secret that the Army and, frankly, our entire defense establishment, made serious mistakes and miscalculations in Iraq since 2003," Gallego added. There have been numerous "lessons learned" studies and reports over the years on the Iraq war from think tanks, academic institutions and retired and active duty military officials. In 2012, Maj. Matthew Hover, an Army Judge Advocate, published a study titled "The Occupation of Iraq: A Military Perspective on Lessons Learned." Many existing studies and reports appear to have reached the same conclusions as the Army's draft report, as reported by the Wall Street Journal -- that the mission given to the military was never adequately defined, and the means to carry out the mission were never properly funded. 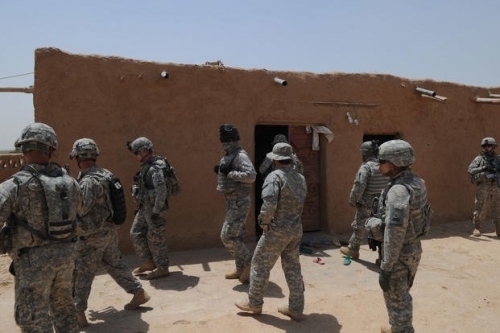 However, Speier and Gallego said the release of the Army's report was necessary to put an official perspective on a war in which more than 4,550 U.S. troops have been killed thus far. Various estimates on the costs of the Iraq war to taxpayers generally range from about $800 billion to $1.7 trillion.